Prof. Gabriella Arru, longstanding professor of Italian in Cyprus, has received the Italian decoration of “Cavaliere della Stella d’Italia” (Knight of the Order of the Star of Italy) from the Ambassador of Italy to Cyprus, H. E. Andrea Cavallari, during a ceremony held at the University of Cyprus at the presence of colleagues and friends. 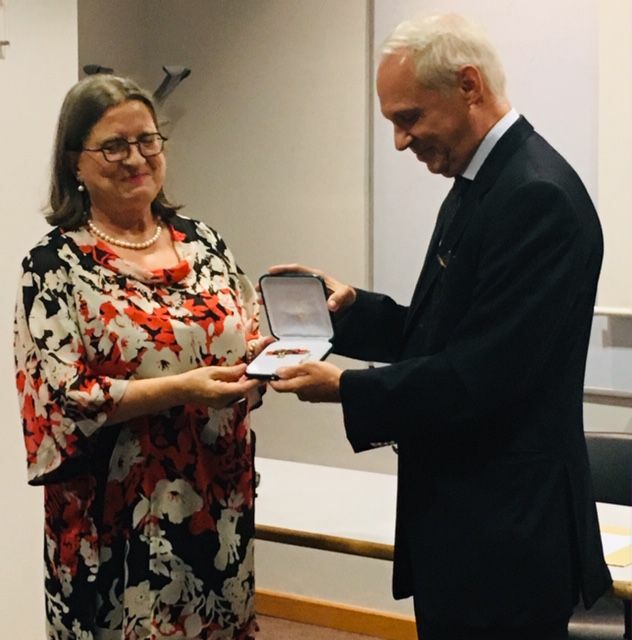 In awarding the decoration, Ambassador Cavallari called Gabriella Arru “a mainstay for the teaching of Italian language in Cyprus”, recalling that she has taught Italian since her arrival on the island from Italy in the early nineties. Prof. Arru went on to become the first teacher of Italian at the Language Center of the University of Cyprus and then Coordinator for Italian of the Language Center, a role she still holds today after more than a quarter century. During these years, she taught countless students, some of which have continued their studies in Italy and/or have created long-lasting links with Italy. She has also been an advocate for the Italian language both within the University and beyond. Due to her reputation as an authoritative professor of Italian, she has been asked to assist the Ministry of Education in various fields. She has also been instrumental in fostering cooperation between the Embassy, the University of Cyprus and Cypriot Authorities. The ceremony took place during the 18th Week of Italian Language in the World, on the sidelines of the Conference “Networking: status and perspectives of the Italian Language in Cyprus” which was attended by all the main actors for the promotion of the Italian Language in Cyprus.